Have you ever been just a bit disappointed when you receive a gift card as a present? This doesn’t mean you are greedy or ungrateful; it just means that, perhaps, you were hoping for a gift that was more personal. We all love to get presents – there’s no denying it! But what makes it so special is that someone thought of us. When we get a gift card, it can seem impersonal. It may not be; the giver may know that you’ve been eyeing a new pair of sneakers and wants to let you choose your own size. The giver may know you love to shop! Whatever the case, there are good intentions behind the gift. But we can make our good intentions known more clearly when we create a homemade gift card holder. There will be no doubt that you were thinking of your recipient then! You don’t have to be a craft expert to make wonderful gift card holders. You can even use some pre-made materials to get you started. Martha Stewart suggests buying inexpensive pre-cut tags. Get the kind with grommets on the end (which allows you to put a ribbon through, if you want). Cut a piece of fabric or extra-wide ribbon so it measures 3.5 inches. Fold each cut end under by ¼ inch and glue securely. 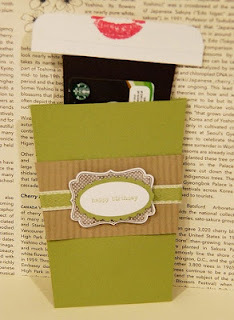 Sew (or use strong glue) the bottom and side edges to the tag to form a little pocket for the gift card. Voila! A beautiful, thoughtful card holder. You can do something very similar just using fabric or felt and making a little pouch. For this next one, use a piece of cardstock and trim it very carefully so it measures 6 5/8 inches x 4 ¼ inches. When you have trimmed it, fold one end in towards the center and flatten it. Fold the other end in to the middle and flatten it. Now you have a tri-folded little envelope. Next, unfold it and lay it flat on your working surface. Decorate it with fun stamps or even with crayons and markers. (This way you can get children involved as well.) A nice touch is to sponge all of the edges with a complementing or contrasting color. Fold the card again to reinforce the lines and then get ready to glue or tape it together. Double-sided tape works well for this, as does glue. Make sure that you leave enough room so the gift card fits in though. Put your glue or tape on the two sides of the middle third, and then fold up the bottom third and press it down firmly to achieve a strong adhesive bond. You are just about done. You now have a functional envelope for your gift card. You can tie a ribbon around the whole card or around the top flap and adorn the front of the card with a greeting or the name of your recipient. There are endless videos and tutorials online available to help you make your own wonderful gift card holders. Take advantage of them! Watch craft experts as they effortlessly create these beautiful, personal holders – and then try your best to do the same. You can always add your own ideas and variations so you make a holder that best suits your recipient. It is the thought that counts. Sarah is a writer who enjoys doing crafts and giving creative gifts. She also contributes articles to the All About Gifts & Baskets blog, where you can find all kinds of discount gift baskets.